Turn your automobile into a precious gem! The Pinnacle Black Label Diamond Coating Complete Kit is the crown jewel in surface protection and creates a dazzling, show-quality shine. A line of products, developed with no compromise, and designed to exceed the expectations of the most discriminating enthusiast, Black Label's collection of coatings make it acceptable to expect more from surface car products. Your automobile deserves Black Label. The Pinnacle Black Label Diamond Coating Complete Kit contains premium paint, wheel, and glass coatings as well as the polish necessary for flawless results. Treat your automobile with Pinnacle Black Label Diamond Coating Complete Kit, you deserve it too. 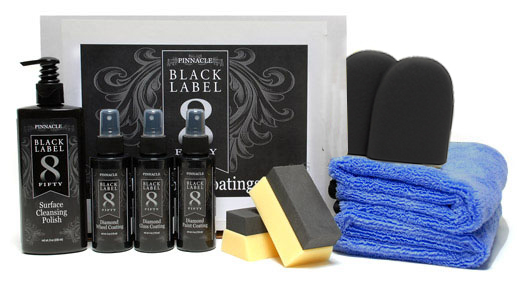 The Pinnacle Black Label Diamond Coating Complete Kit includes. Rare and precious elements, such sea-born pearls and sparkling gemstones require pure, near-perfect environments to form. With just a hint of contamination. a flawless diamond will remain coal. Pinnacle Black Label Surface Cleansing Polish deep cleans and prepares the surface, creating the perfect environment for Black Label Diamond Coatings to crystallize a into highly-reflective, gem-like shields of protection with unmatched purity. Pinnacle Black Label Diamond Paint Coating is the product of choice for the perfectionist who demands excellence. Using the latest in crystallizing nano-glass ceramic technology, Pinnacle Black Label Diamond Paint Coating emblazons paint with a radiant shine and crystal-clear reflections. Proudly carrying on Pinnacle's tradition for excellence, Diamond Paint Coating is the ultimate paint coating for dazzling looks and unmatched protection. Pinnacle Black Label Diamond Glass Coating creates an optically clear layer of crystallized protection on your automobile's windshield and exterior glass. Diamond Glass Coating is super hydrophobic, meaning that water runs off quickly, so you no longer have to fear driving in the rain. Pinnacle Black Label Diamond Glass Coating also prevents road oil, film, grease and dirt from attaching to the glass, so your vision stays clear no matter what the road ahead has in store. The Lake Country Coating Applicator is the perfect compliment to Pinnacle Black Label Coatings. The It applies perfectly even and extremely uniform coats of your favorite paint or surface coating. A dual-sided design ensures that you get the most coverage per drop of your coating, while providing an easy-to-hold handle for maximum comfort. The ingenious rectangular-block design of the Lake Country Coating Applicator allows you to apply coatings quickly over large areas, while giving you the ability to coat the most complex body panels with ease. Apply your favorite Black Label Coating to the most intricate spots with these ultra-soft applicators. The Black Wax Finger Pockets are perfect for wheel spokes, under door handles, around trim, and other areas which deserve the utmost in protection. Use the Miracle Towel to softly buff over any surface where any Pinnacle Black Label Coating has been applied. This thick, luxurious nap will level any high spots, ensuring a diamond-smooth finish with unmatched brilliance. This towel features an extremely-soft 70/30 blend of polyester and polyamide so it will not scratch the most sensitive areas. A total retail value of $264.92. You save $64.93!